One of the most popular yet exclusive wedding locations in California is the beautiful Resort at Pelican Hill. With its 180 degree views of the Pacific Ocean, manicured groves of olive trees, rows of lavender, columned Coliseum Pool, and breathtaking ceremony site with classic Italian rotunda, the venue is a dream for luxury weddings. The rotunda, in a classic Renaissance design, is perched 300 feet above the ocean and perfectly romantic location to exchange vows. For this Orange County wedding, the rotunda structure was decorated with crystal chandeliers and giant white flowers made of paper! 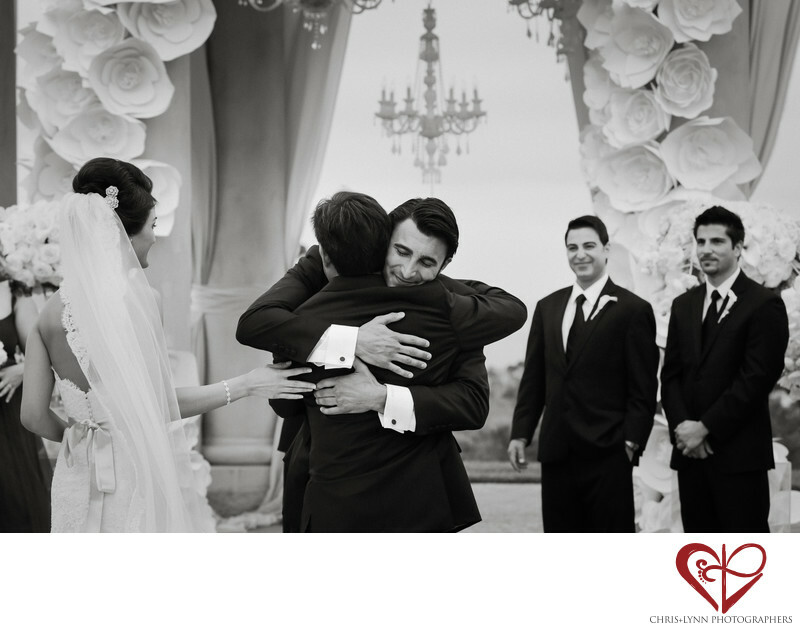 The wedding decor was the perfect backdrop for this moment between the father of the bride and the groom. I love the intensity of the hug and how the bride's hand is touching the two most important men in her life. Such an emotional moment! This classically beautiful Persian wedding was planned and designed by Kerrie Underhill of Platinum Weddings and was featured in California Bride Magazine. Wedding Cinematography was provided by Julie Hill from Elysium Productions. Location: 22701 S Pelican Hill Rd, Newport Coast, CA 92657, USA. 1/800; f/5.6; ISO 800; 100.0 mm.